I visited Marianne for a series of portraits. Well, actually that's only half of the truth. Maybe I should write, I visited Marianne for a walk through the city, a cup of coffee and piece of cake, some good talks …and eventually a photo shoot. 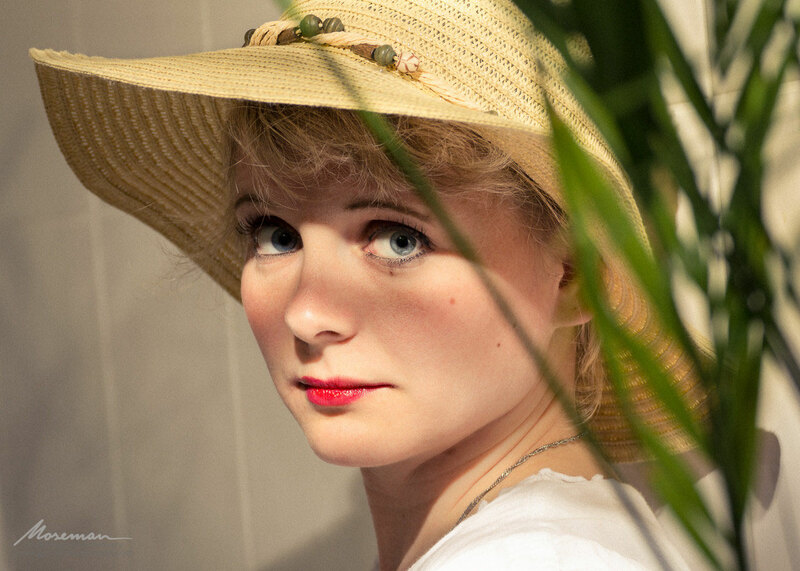 My goal was to portrait her in her apartment and make some classic photographs of her and her cat Eddie. So we started with natural light and natural poses. Being a painter herself, Marianne was very patient as a model and turned out to be a great contribution to the pictures. She showed me her wardrobe and suddenly lots of new ideas emerged for the both of us. In the end time was too short to realize them all. Yet, we ended up experimenting. I don’t remember who of us came up with the idea of doing something more “vintage.” But I had a summer picture in mind. So she dressed in that white summer skirt and found that hat in her closet. I didn’t need to convince her to put on some lipstick for a stronger color contrast. Now the only problem was to find a beach in her apartment (or in cold continental Germany). When I noticed that plant in her bathroom, I had an idea: What if I use it in the foreground and as “gobo” palm tree to cast some shadows on her face and on the background? The result was quite satisfying. In post processing / developing I added a warm touch and emphasized the colors. For me, red, green and blue - the three split complementary colors - work well in the picture and add a special focus on the facial features. After the session we both were excited about the results. In the end Marianne was very happy when she finally saw the pictures. Below is one of my most favorite photos from that afternoon with her.